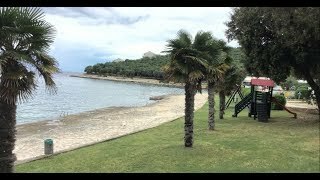 Located near the pretty town of Vrsar and its charming marina, Porto Sole is a spacious and comfortable campsite with a long water frontage and two tiny bays that provide rocky swimming areas. The site has good facilities, including a large and attractive first floor swimming pool and sunbathing area above the shopping arcade, restaurant, pizzeria and pub. There are 730 grassy touring pitches, most in front of the reception area. They are reasonably level and fairly open with 6-10A electricity but have hardly any views of the sea. In a separate area, there are a few pitches for tourers set on terraces looking out over a small bay. In peak season the site is buzzing with activity and its hub is the pool and shopping arcade area where there are formal and informal eating areas. The food available is varied but simple, with a tiny terrace restaurant by the water. The five toilet blocks (one refurbished in 2014) have mostly British style WCs and are very clean and well maintained. Facilities for children and disabled visitors. Washing machines and dryers. Large well stocked supermarket (1/5-15/9). Small shopping centre. Pub. Pizzeria. Formal and informal restaurants. Swimming pools (1/5-29/9). Massage. Miniclub. Play area. Boules. Tennis. Minigolf. Entertainment in season. Scuba diving courses. Boat launching. WiFi throughout (free). 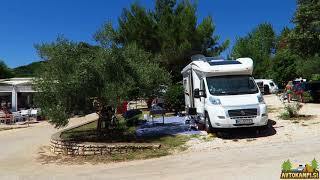 Site is on the coast 500 m. south of Vrsar. From main road take turning for Koversada then follow site signs.